Other angel parents who lost children spoke of the losses. “This is Ronald in the coffin, this is the reality that I live with, and unlike — this is not manufactured, I want to tell the Democrats, this is not manufactured. And I want to call on our president to please, implement E-Verify, please, stop the insanity for illegal aliens to come to our country and punish employers. This guy that murdered my son would be coming out of prison next year. My peace and quiet will be taken away from me and my family because I don’t know if he is going to come after me. Why should he live?” Agnes Gibboney, mother of Ron Gibboney. Ron was murdered by an illegal. And California may release him. Agnes is a legal immigrant. The fact that the Democrats are refusing to listen to Americans in any form speaks volumes about their real agenda. 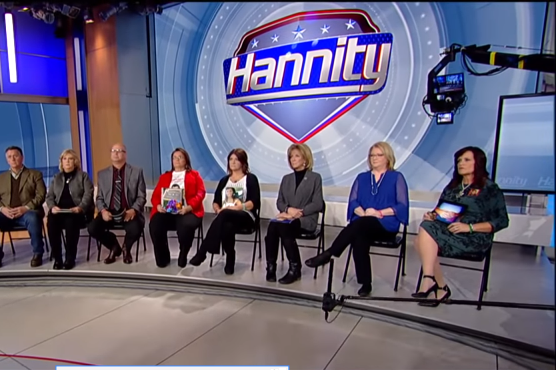 Hannity had several angel parents on his show, but their stories are repeated across the nation…Democrats only care about illegals and the votes they hope to get. They also do not care about the costs of dealing with the illegal aliens that come to this country. On Laura Ingraham’s show, DJ Corcoran held a photo of his son Pierce, 22. His son died when an illegal alien struck him in a vehicle. Nancy and Chucky need to pay attention to the American people instead of the illegals.